A kind of lazy day--resupply in the morning, walking in the afternoon to a great campsite. Weather Report: Low 42, High 72. Sunny, dry, a slight breeze. Great hiking weather. Daily obsession: Take things as they come, at my own speed, no real goals, just mellow. I found out last night that my buddy James had come off the trail, and was much happier for deciding that. Yay that he figured that out, but it also put me in a bit of a funk. I'd been walking a bit more than usual, not just to get to a warm bed, but to actually just catch up and have someone to talk to. Now that James is no longer ahead of me, I need to make some new friends. I made some small talk with another through hiker at the hostel (didn't catch his name), and this morning I chatted a bit with Samson who's resting another day and won't be heading out today. My plans were kinda simple: eat a good breakfast, mail some stuff home that I don't need, and get on the bus to Vons. Then figure out a way to get back to the trailhead up on Highway 18 at mile 266. 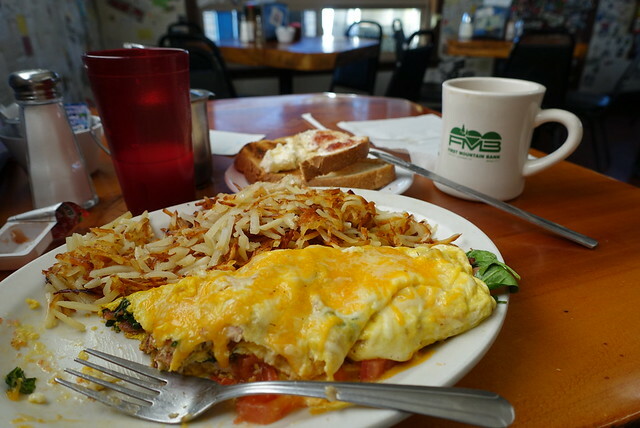 Breakfast was easy: I'd picked up a menu at the trail magic stop yesterday, so I knew I was going to walk ten minutes over to Grizzly Manor and nom. There I ended up sitting next to Magoo and McGee, who were known in these here parts as thru-hikers. We chatted, I told them about James, they were concerned but I said he's happy... then they went on their way. They're also laying over another day, and moving to the hostel. A quick trip to the post office (architectual style best described as rustic alpine Polynesian, circa 1966), and then I hopped a public bus to the Vons for the typical resupply: couscous, Knorr pasta sides, Clif bars, Fritos, mixed nuts, Crystal light... and because fruit is a rare treat on the PCT (aka: Trail of Starch), an apple and a banana. Enough food to get me most of the six days to Wrightwood, with some wiggle room to stock up at the Chevron convenience store at I-15. The next 20 miles appears to be dry, so I didn't overbuy, as I'd be carrying 3.5 liters of water which is heavy enough. After Vons, I got on a new bus and quizzed the bus driver as to where a good place would be to thumb a ride east on Highway 18. He said a lot of people had luck at the LDS church, he dropped me at the corner. I set down my pack, stuck out my thumb, and the first passing car pulled over. Jaime was headed to Lucerne to sell a car, and happily helped me get up those five miles to the trailhead. I got on the trail at 1pm, not particularly worried about making time. I thought 8 miles would be OK, so I chugged along through pinyon and sagebrush, nothing exciting. Once the trail wiggled up a ridge though, it smoothed out into very fast soft dirt track, and I made good time, bouncing along. At 4 I stopped and took off my pack to rest... and I ended up falling asleep for a micronap. What? I've felt exhausted enough but never sleepy until today. Weird. 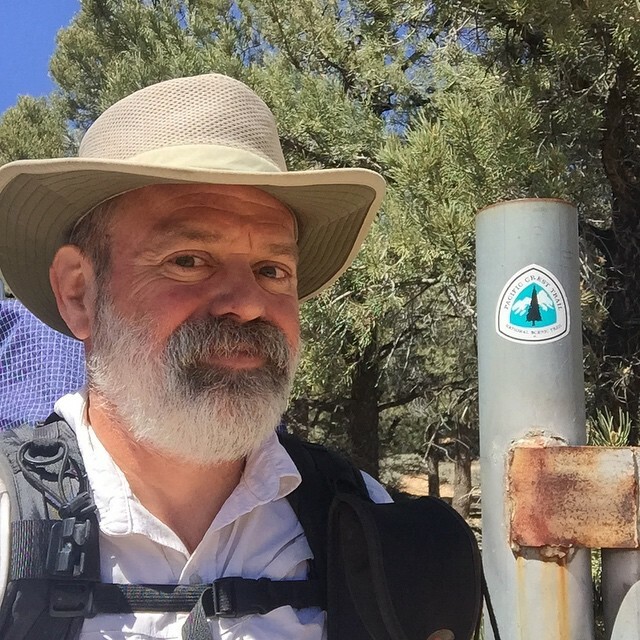 I spotted a nice description for a campsite at mile 277, "with picnic table", and that motivated me to get going and keep going for another couple of miles. But sniff, when I got there the table was all broken up (sad wa-wa sound)... and it was in a windy gap, so I checked the topo and found a saddle not even a mile further. Saddles usually have good flat spots, and you can often find one out of the wind. At 6:30, I found it -- a nice soft sand space big enough for one tent, with a great view across Big Bear Lake to San Gorgonio Mountain. It was even kind of wind sheltered--there's supposed to be some strong winds through tomorrow midday. 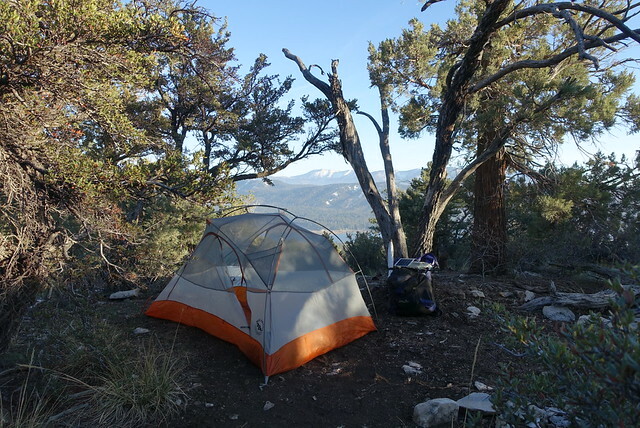 It was a good place to crash for the night; I put on the rainfly and shoved the Sawyer in the foot of my sleeping bag. It's going to be below freezing. Brrrr. Looking forward to warming up in Deep Creek Hot Springs in a couple of days of easy downhill walking.